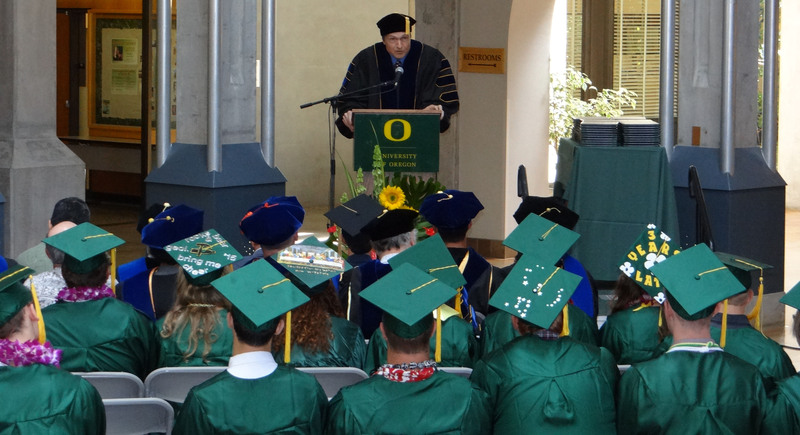 The Department of Physics’ faculty and staff invite graduates and their guests to attend the department’s graduation ceremony and reception in the Paul Olum Atrium in Willamette Hall. No tickets are required. Undergraduate students apply on Duckweb. The deadline to apply for a Spring undergraduate degree is April 28th. Graduate students apply on the Graduate School Website. The deadline to apply for a Spring graduate degree is April 12th. Be sure to apply for the term in which you will actually finish your degree. Degree application information can be found on the Registrar’s Office website here. PHYSICS COMMENCEMENT SURVEY REQUIRED FOR PARTICIPATION IN CEREMONY. All of our graduates are asked to complete a short exit survey that lets us know if you plan to walk in the department ceremony and includes a few questions about your post graduation plans: Spring 2019 Commencement Survey. The ceremony is for both graduate and undergraduate physics majors (we hold a combined ceremony with the Earth Sciences Department). Graduating students will be individually recognized as they receive their diploma. The ceremony will be approximately an hour long, and a reception with refreshments will follow. 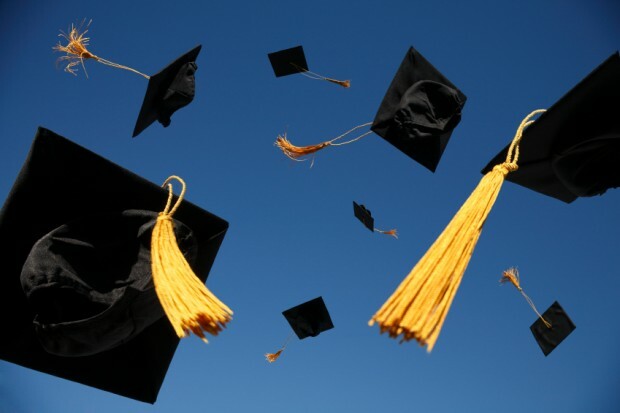 Graduates should plan to arrive between 11:45 a.m. and 12:00 p.m. on graduation day. Please check in at the table at the main entrance to Willamette Hall on 13th Street. 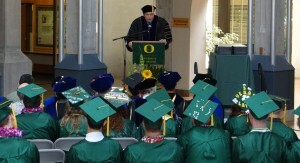 Announcements and regalia (cap, gown, and tassel) can be ordered from the UO Duck Store starting March 28th. Order your regalia by April 11th for the early order price. After April 11th the price for regalia will increase. Graduates are not required to wear a cap and gown but most do. The UO Duck Store will hold a Grad Fair April 8-11 from 10am-6pm. Representatives will be present from many regalia, announcement, and photography companies to answer your questions and take care of all your graduation needs in one place. GradImages will be providing commencement photography for the university, and will photograph our graduates at the department ceremony. Students can pre-register at www.gradimages.com. You will be contacted by GradImages after the ceremony with information on how to order photographs. If graduates or guests will need special accommodations please notify Jodi Myers at myers2@uoregon.edu or by phone at (541) 346-4787. Wheelchair seating will be available in the atrium. Please encourage guests to make their reservations for hotels early as local hotels fill quickly this time of year. Parking on the UO main campus during commencement is strongly discouraged. Please encourage guests to arrive at Autzen Stadium at least an hour prior to the ceremony start time. Visit the main university commencement website for parking recommendations, shuttle information, and maps: commencement.uoregon.edu. Note: parking is provided for the day at Autzen Stadium with the campus accessible by shuttle every 15-20 minutes. Guests with limited mobility or who require accessible transport click here. We encourage graduates and their guests to also attend the main University of Oregon commencement ceremony beginning with the Grad Parade to the Matthew Knight Arena on Monday, June 17th at 8:15 a.m. Details regarding this celebration can be found at: commencement.uoregon.edu. Who may walk in the Department of Physics ceremony? Undergraduate physics majors and graduate students who graduated Fall 2018, Winter 2019, or who applied to graduate Spring 2019, or who WILL graduate Summer 2019. Whose name is listed in the department commencement program? Students who apply to graduate Spring 2019, Fall 2018 and Winter 2019 graduates, and students who are graduating Summer 2019 and notify us that they plan to walk in the ceremony on June 17th. Summer graduates who don’t notify the department will not be listed in the program. How do I notify the department that I plan to participate in the ceremony on June 17th? For planning purposes, the department needs to know how many students will be walking in the ceremony. All graduates are required to complete the Spring 2019 Commencement Survey to let us know if they plan to walk in the department ceremony.